A peaceful portage, bringing together the artistic talents of dozens of local students, set out for Aurora on Tuesday night on the path towards Truth & Reconciliation. The Sacred Canoe, a multidisciplinary art project spearheaded by students of Newmarket’s Sacred Heart Catholic High School, was launched in a spectacular fashion last Tuesday at St. Andrew’s College. The Sacred Canoe itself is twofold, both a spectacularly painted 19-foot-long vessel and a three-part dramatic project, but before the canoe began its journey to Ottawa to be presented to Chief Kirby Whiteduck of the Algonquins of Pikwakanagan First Nation in a ceremony hosted by Newmarket-Aurora MP Kyle Peterson to coincide with the International Day for the Elimination of Racial Discrimination, both took centre-stage at SAC. The Sacred Canoe is a multidisciplinary art project launched in 2017 to answer specific calls to action from the Truth and Reconciliation Report, say project organizers. It included over 150 watercolour landscapes, dry-point etchings and spirit animals designed by the Newmarket students, under the guidance of teachers and Indigenous Community members who acted as mentors. The designs were inspired by photographs taken at Webequie First Nation Reserve, its surrounding areas, and stories that were told from students at the Innulik School in Quebec. 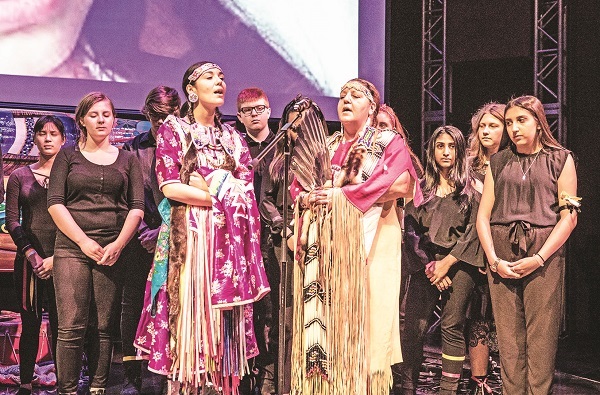 Integral in the performance aspect of The Sacred Canoe were Aurora teacher Dawn Ellis-Mobbs, Department Head of Arts at Sacred Heart, and Newmarket Musician Glenn Marais. Mr. Marais explained the evolution of the four-part play that highlights the importance of reaching Truth & Reconciliation. “The first part of it speaks to the early relationship between settlers and indigenous people, where they first worked in harmony, running in parallel paths without interfering in their culture and sharing in trade and helping each other to thrive in the early stages of Canada’s history,” said Mr. Marais. “The second part tells the story of colonization and the Indian Act, when things changed after the War of 1812 for indigenous people dramatically. The third act illustrates and speaks to the Residential School system and the impact it had on indigenous communities and their children. Among the participants in last week’s ceremony were Suzanne Smoke of the Alderville First Nations, who spoke about the relationship of the Indigenous Peoples – and indeed all peoples – to the water, Newmarket Mayor John Taylor, who spoke about the history of local indigenous settlements, and Mayor Tom Mrakas, who delivered video greetings due to a conflict with that evening’s Council meeting. “I want to congratulate the project team…and the students of Sacred Heart for their work on this incredible project,” said Mayor Mrakas. “The painting on the canoe sends a very moving message; a message which must be heard across our country. Reconciliation can only happen when two cultures walk together, side by side, in harmony and peace.